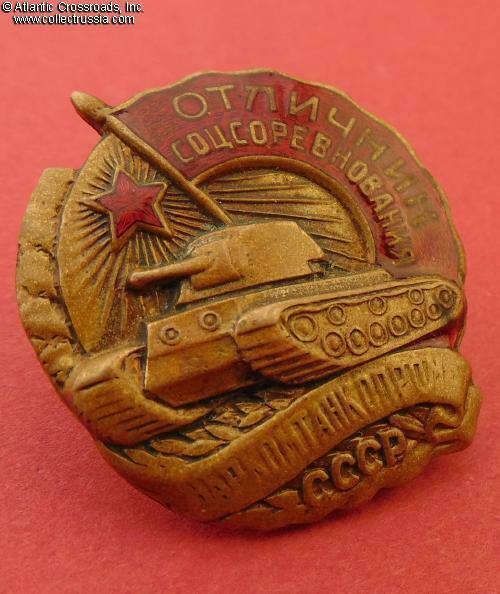 Badge for Excellence in Socialist Competition, Narkomat of Tank Manufacturing, 1942-46. In gilded brass and enamels; measures 32.8 mm in height (not including the flagpole finial), 31.9 mm in width. Shows a KV tank under a red banner. In very fine condition. The enamel on banner is nicely preserved overall having only a single tiny surface flake in the upper left corner of the banner - almost unnoticeable to the naked eye - and some microscopic contact marks elsewhere, completely free of repairs, penetrating chips or significant rubbing. The enamel on the red star has some barely noticeable scuffs. 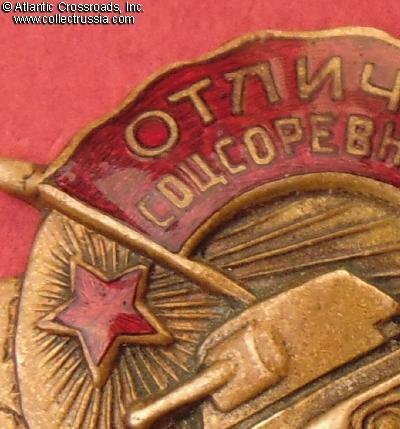 The red enamel on both the banner and star fully retains its beautiful original luster. There is moderate wear to the lower part of the badge under the tank and to the wreath on the left side, but most details are still well-defined. Traces of the original fire gilt finish are visible in recessed areas on the obverse. The silver plating on the reverse almost pristine. 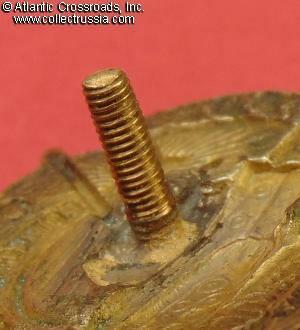 The screw post is original and full length, over 10.5 mm long. 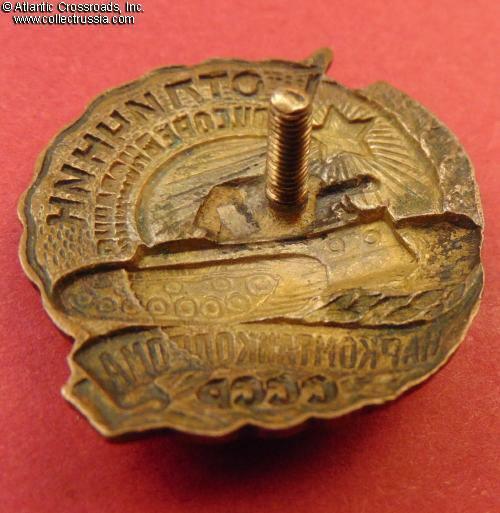 It has been re-threaded to accommodate a replacement screw plate marked "Leningrad Mint" which is of slightly later vintage than the badge itself. 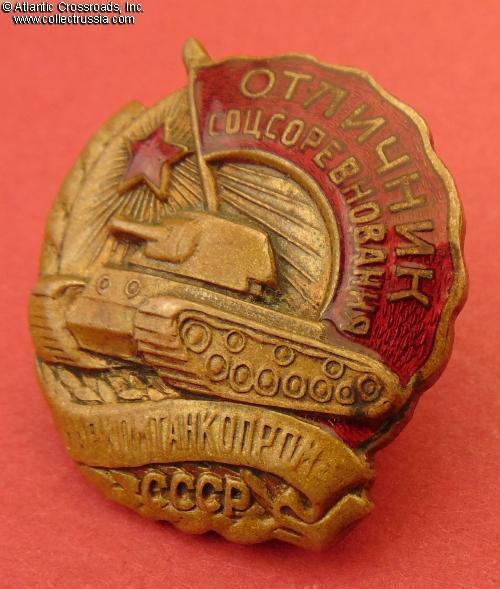 Overall, an attractive example of the Soviet WW2 tank builder's badge. 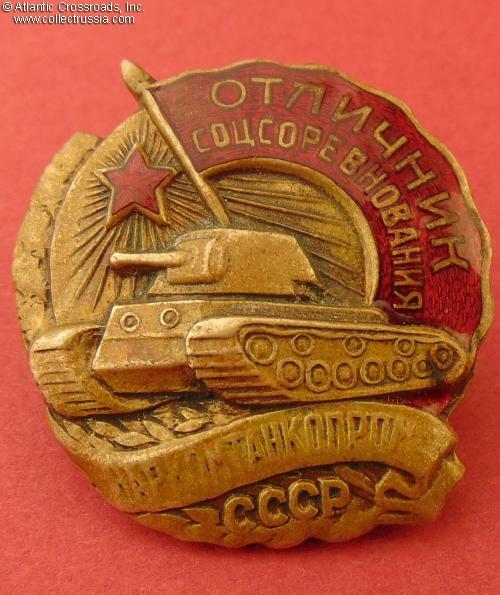 Badge for excellence in manufacturing tanks was the first Soviet award badge instituted during the Great Patriotic War. The Tank Narkomat was formed in September of 1941, immediately after the German invasion. This of course underscores the importance of tanks in Soviet military doctrine. 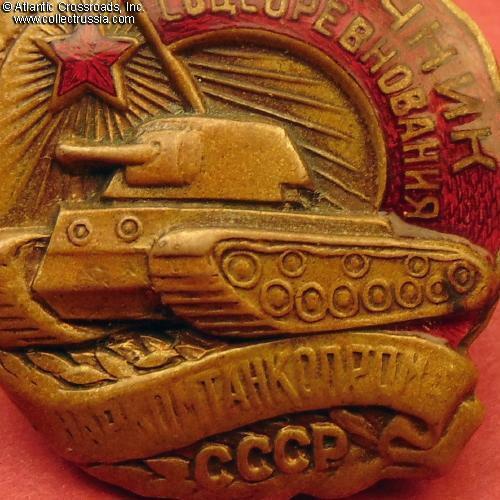 The well-armed, heavily armored and highly mobile Soviet T-34s and KVs (like the one shown on the badge) came as nasty surprise to the invaders: in the summer of 1941, Wehrmacht had no comparable tanks in its inventory or even in advanced design stages. /See "Avers 8", p. 108, fig. 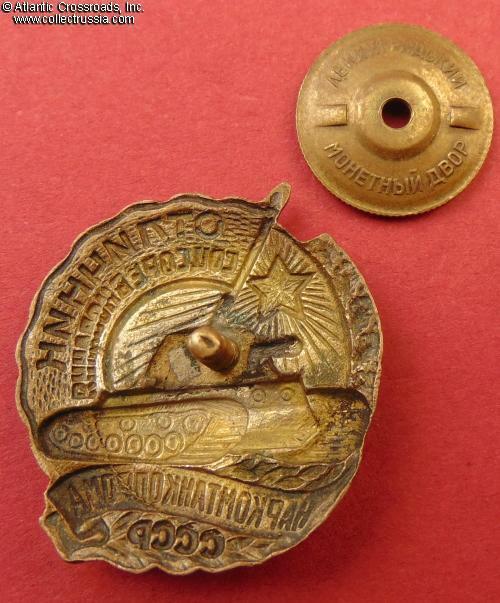 578b, also Badges of Narkomats "Ural Photo Catalog of Soviet Phaleristic. Part 2", p. 65/.